George was born in Greenham on 4 October 1884 the son of James Harrison and his wife Martha née Hill; he had six full siblings: Ada (born 1877), Rose Emily (1878), Florence Kate (1880), Ellen Eliza (1882), Edward Joseph (1886), Christopher Charles (1888) and one half-brother, James Henry (1869), from his father’s previous marriage to Caroline Holder. It is probable that Caroline died from complications following the birth of second son, Charles, who died a few weeks after his mother. Martha also died relatively young (39) in 1890 when George was only six leaving James to bring up his large family of young children. George was educated at West Street junior school and St Nicolas National School in Newbury attending the latter from 1894 until 17 May 1897 when, aged 13 he left school for good. This may appear young by modern standards, but the school leaving age in the 1890s was 12 – George gained an extra year of education when his father told the school he was born in 1895, knocking a year off his age. He trained as a plumber, a useful trade that would normally require an apprenticeship. 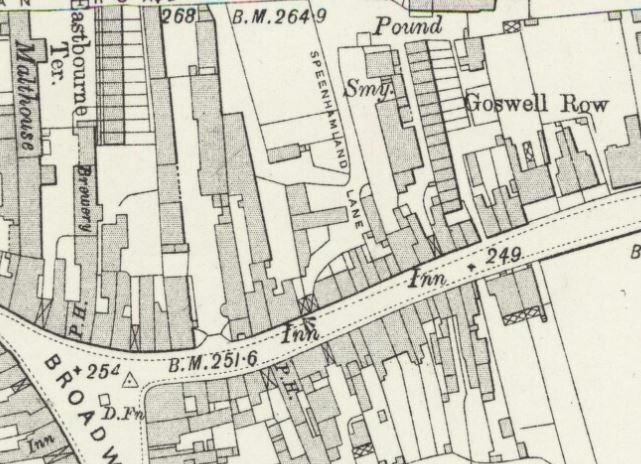 of Goswell Row (upper right). On 23 April 1905 George married Rhoda Mary Ann Baggott in Caversham, where their first two children, Ivy Rhoda (1906) and Ellen May (1908) were born. By the time their third child, Dorothy A was born in 1910 the family had moved to Newbury. By 1914 he was working for Richard Ravenor who ran a successful plumbing business from his house in Oxford Street (now part of the Chequers Hotel), probably the job that brought him back to Newbury. Two more children: George A E (1912) and Stanley W (1914) completed the family. They lived at 9 Goswell Row, one of a terrace of cottages that was demolished to make way for Tanner’s Court, Pelican Lane. In January 1915 George left his job to join the army, electing to serve in the Royal Artillery. 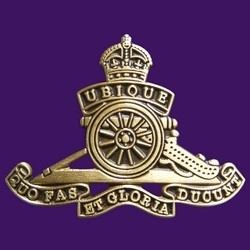 He was posted to the 46th Brigade of the Royal Field Artillery (RFA) which was a howitzer brigade of four batteries operating in support of the 14th (Light Division), one of the first of the new Kitchener Army divisions to go to France. George crossed to France with the rest of the division in May 1915 (he landed on the 19th) The 14th Division has the unfortunate record of being the first to face flamethrowers when the 41st Brigade was attacked in Hooge Crater on 30 July 1915. He does not appear in a nominal roll of the Brigade taken in December 1915 and included in the unit’s war diary, which cast a little doubt on the account of his being with it throughout his army career. However, if it quite possible he was absent on leave or sickness on the day the roll was taken. He was given seven day’s home leave in October 1916, which turned out to be the last time he saw his family. D/46 had direct hit on cookhouse, 1 man killed. 11am D/46 ordered to change position, retired to vicinity of other Batteries. Bombardment orders for X & Y days D/46 fired special shell from 9.30 to 10.30 when stopped owing to unfavourable wind. One of the main roles of artillerymen was to kill or incapacitate their opposite numbers behind the German front lines. 'Special' shells were loaded with gas - which rarely killed anyone, but forced the enemy to wear gas masks, which radically reduced their efficiency. It seems that the shell that hit the cookhouse was one of several aimed at their position – which would indicate that the enemy knew where they were – hence it was time to move. Mrs Harrison of 9, Goswell Row, London Road, has received information from the War Office, as to her husband, Gunner George Harrison, who was killed in action on the 20th April 1917, somewhere in France. Deceased was the son of the late James Harrison of Russell-road, Newbury, and leaves a wife and five children. He joined the D Howitzer Battery, 46th Brigade, 14th Light Division, RFA, in January, 1915, and after his training at Portsmouth, Exeter, and Aldershot, he was sent with the British Expeditionary Force to France in May, 1915. Previous to his joining up he was a plumber and decorator in the employ of the late Ald Ravenor, of Speenhamland. He was home on leave in October for seven days, and the last letter which Mrs Harrison received from her husband was written on the 19th of April, the day before he met with his death. Deceased was 34 years of age. those whose nearby graves were lost. George was buried in Wancourt Road Cemetery No. 2 on the eastern outskirts of Neuville Vitasse. Later in the war this cemetery one of several in the area that were destroyed by shellfire. Those buried there are now commemorated on a special memorial in London Cemetery, Neuville-Vitasse. George’s name is on panel 1 of this memorial. 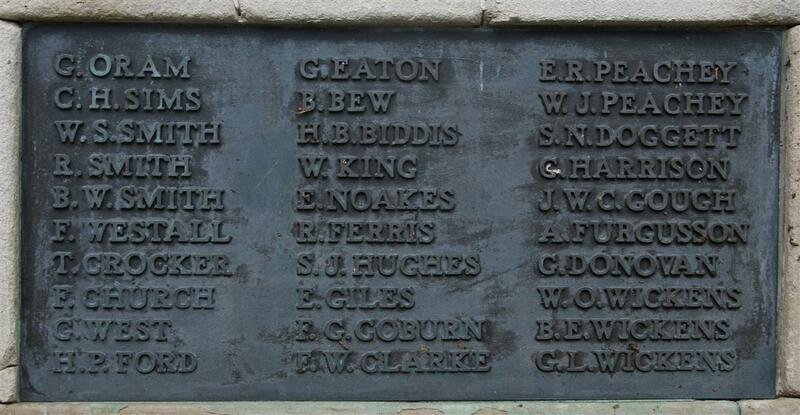 Locally George is remembered on tablet 11 of the Newbury Town War Memorial and the Speenhamland Shrine (the memorial to the fallen from the parish church of St Mary’s, Speenhamland – located in St Nicolas’ Newbury since St Mary’s was demolished in the 1970s). It is possible that he was also remembered on the St Nicolas’ parish memorial board and roll of honour as F G Harrison. However, there is no record of his having another forename so, despite the fact that it has, to date, been impossible to identify F G Harrison, the association with George remains problematic. George’s employer, Richard Ravenor lost three sons, Richard, Herbert and Geoffrey in the war.